Tornadoes killed at least 21 people and injured hundreds as they ripped through the central and southeastern United States over the weekend, destroying homes, overturning cars and downing trees and power lines. Authorities said 14 people died in Missouri, six in Oklahoma and one in Georgia as the storms tracked a course from the border of Kansas and Oklahoma Saturday into Georgia Sunday. Georgia authorities said earlier two had died in the state. Twelve people were killed and more than 150 houses were damaged in Newton County, Missouri, on the Oklahoma border, said Susie Stonner of Missouri’s Emergency Management Agency. Hardest hit was Racine, a tiny community in Newton County about 170 miles south of Kansas City. 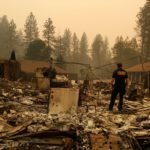 The path of destruction was a mile wide in some places, said Jason Schaumann, a meteorologist with the National Weather Service in Missouri. Damage indicated an EF3 tornado, which would have estimated wind speeds of 136 to 165 mph, he said. Hail the size of softballs and wind gusts of 80 mph were also reported in Missouri, where 85 people were injured, authorities said. Six people were killed in the small northeastern Oklahoma town of Picher, officials said. Local television footage from Picher showed homes ripped from their foundations, trees stripped of leaves and sheet metal twisted like paper. “Basically a 24-block area is virtually destroyed,” said Michelann Ooten, a spokeswoman for the Oklahoma Department of Emergency Management, adding that 150 residents were treated for injuries ranging from broken bones and serious lacerations to minor scrapes. Oklahoma Governor Brad Henry ordered National Guard troops to help with rescue and recovery. Picher is at the center of a massive federal clean-up of pollution from lead and zinc mining. Residents were being assisted with relocation from the community after high levels of lead were found in groundwater. President Bush offered prayers for families of those who died and said a day the country celebrates as Mother’s Day was, for some, a sad occasion. “The federal government will be moving hard to help. I’ll be in touch with the governors and offer all the federal assistance we can,” Bush said before boarding Air Force One at Waco, Texas. One person died in Georgia’s Laurens county, just one of 19 counties in the state that reported storm damage, said Lisa Janak, spokeswoman for the Georgia Emergency Management Agency. In Missouri, Howard Birdsong, the mayor of Neosho, a town of 11,500, said at least two of the deaths happened when a tornado overturned a vehicle. In Barry County, one person was killed in Purdy, where several trailer homes, a church and other residences were damaged, the National Weather Service said. A tree fell on a trailer home in Carthage, Jasper County, killing one person.